Tonight I was drawing with Penny and her mega sketcher. 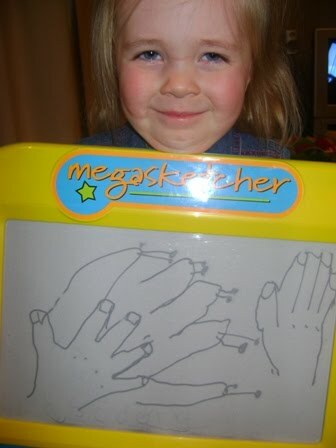 She decided she wanted to draw my hand so asked me to put it down and she drew around it (a little generously, I may have short stumpy fingers, but they're not that bad). Anyway, I said 'How about some fingernails?' and then continued chatting about something with Blair. 'All done mumma' - and she proceeds to put the mega sketcher on my knees. Oh how I wish it was drawn on paper, I love this so much. That is one seriously clever little girl! That's hilarious, but also very well imagined and drawn! Love it!